This ray tracing graphics system was built in a graphical programming course. 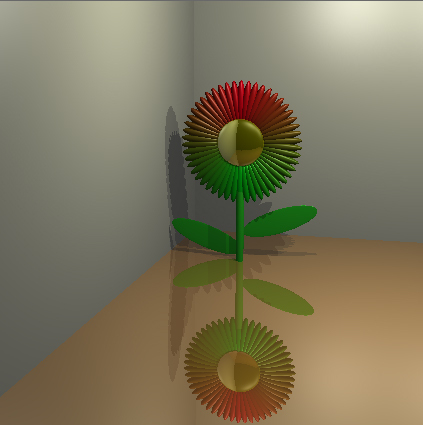 The ray tracer supports the tree major shader types, Faceted, Gauroud, and Phong. It also implements reflections and shadows in true ray tracing fashion (aka, SLOW!). This project is one the single most useful projects to work on due to the intense use of 3D math (linear algebra) that is needed to complete a graphical system. Learning linear algebra in this way, as opposed to typical math course, allowed me to apply it right away. Because linear algebra comes up everywhere in game development, I found that these graphical system courses improved all of my game play programming skills considerably. //this is a rendering from the ray tracer. //It shows off phong illumination, shadows, and reflections.